A wide-ranging federal proposal to expand the role of railway transportation in the northeast United States could potentially bring a new Amtrak stop to Philadelphia International Airport, crank up the speed of trains and increase the volume of intercity rides along the Northeast Corridor. Documents released Friday by the Federal Railway Adminstration (FRA) outline a comprehensive plan to improve the efficiency and reliability of the rail system through an investment plan focused on building capacity in the region's economic nerve centers along the corridor, from Washington, D.C. to to Boston. Map of potential projects under FRA's Preferred Alternative Plan. Formed over a four-year period, the long-term proposal incorporates the feedback of more than 3,200 individuals, agencies and organizations. The full scope of the $120 billion plan, if implemented, would unfold over a 30-year-period, providing more service options and convenience for commuters within and between cities. For Philadelphians, it could mean speedier and more accessible trips to places like New York City and Baltimore, reviving the eventual prospect of last year's much-hyped bullet train proposal that would whisk locals to the nation's capital and New York in 30 and 25 minutes, respectively, using the Northeast Maglev Train. 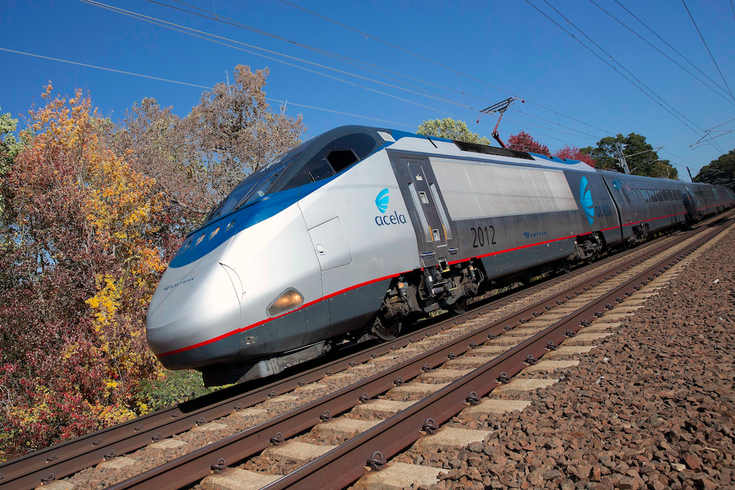 Currently, Amtrak's high-speed Acela trains make the Philly-to-D.C. trip in an hour and 40 minutes and Philly-to-NYC in an hour and 10 minutes. 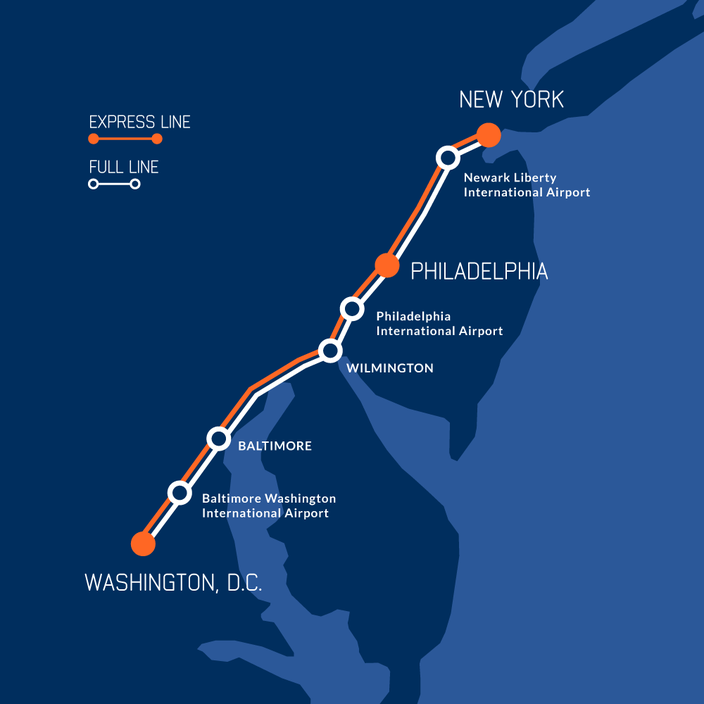 The map below, released last year by Maglev as Maryland received $27.8 million for bullet train research, already envisioned a designated stop at Philadelphia International Airport. The proposed Northeast Corridor line for the Northeast Maglev train. Improvements under the current FRA proposal, known as the Preferred Alternative Plan, would not approach the Maglev speeds with current technology but would, for instance, chop 45 minutes from the current three-and-a-half hour trip between New York City and Boston. Trips between D.C. and New York would drop 35 minutes to two hours and 10 minutes, while the trek from Philly to Boston would fall to three hours and 50 minutes from nearly five hours. Train and track enhancements could enable speeds up to 220 mph between Baltimore and Wilmington, for example. "The Northeast United States is the world's fifth largest economy, contributing 30 percent of all jobs in the U.S. and generating 20 percent of Gross Domestic Product," the FRA said in its NEC Future report. "By 2040, the Northeast is expected to add seven million new residents, putting further pressure on all travel modes. Stronger, more reliable transportation options — including investment in the Northeast Corridor — are essential to support mobility and sustain the region's economic growth." Charts show projected improvements under FRA plan. The crux of the FRA proposal involves building out the rail network to increase daily trains to existing stations and add connections to new stations. Under the plan, Philadelphia would see its daily service to the airport — currently handled only by SEPTA's Airport Line — from 72 to 332 trains, assuming the addition of a station directly serving Philadelphia International Airport. A greater number of intercity express trains could also involve reorganizing schedules so that service routes designed to be quick don't wind up trapped behind local trains at common chokepoints along the Northeast Corridor. The plans could could offer riders from a limited number of stations in Philadelphia and Bucks County to travel straight-through to New York City. Currently, a train trip to the Big Apple requires routing through Trenton or the two local stations currently served by metropolitan trains – North Philadelphia and Cornwells Heights. As the federal plan comes to public consideration, the Northeast Corridor continues to rebound from the May 2015 Amtrak crash that left eight people dead and injured more than 200 others in Philadelphia. Last December, Amtrak activated Positive Train Control technology between Philadelphia and New York City, a speed-control measure that would have prevented the overspeed derailment of Amtrak Train 188. Track improvements, for instance fixing the bend around Frankford Junction, would open the door to safer travel at higher rates of speed. 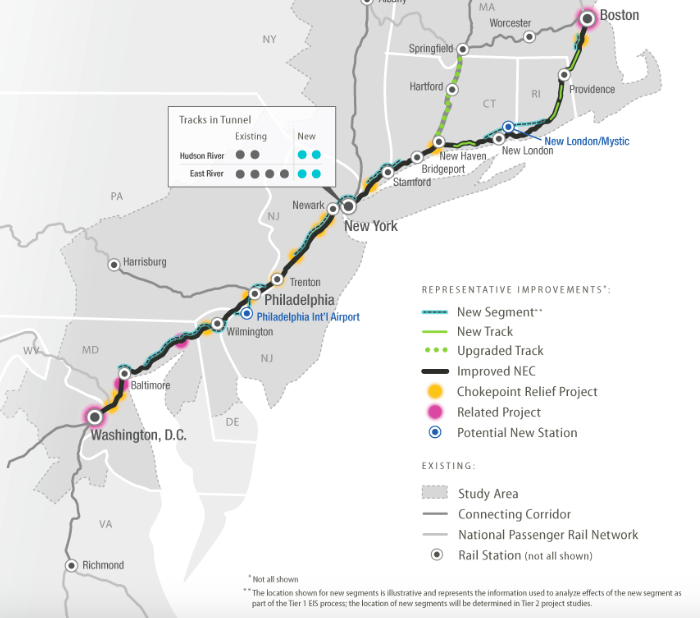 Whether or not the FRA proposal can garner the necessary funding will depend heavily on the contributions of the eight states along the Northeast Corridor, which were involved in the study and planning process. As a massive federal infrastructure strategy, it relies on a long-term vision of the country's economic projections, population trends and the needs expected to arise from both moving forward. Each of the states involved will have an opportunity to enact the FRA recommendations, but there is no definitive timetable to begin construction should the proposal be embraced. Philadelphia, working with Amtrak and other local stakeholders, has independently developed its own plan with several transportation and rail-related improvements in the future 30th Street Station District.